Picked up this raw '53 Mantle recently. My oldest Mick. Love that card! Nice P/U! looking back on this page, I guess the same could be said for Jerry's sweet PSA 2 and Johnny's PSA 7. Something about that '53 Topps. Last edited by CW; 12-20-2018 at 09:47 PM. Had to reload some cash onto COMC when I saw this pop up (cost $260); paid $2 for them to give it a condition review and they consider it Near Mint. RECEIVED PSA 4 VG-EX; ARGH! EX+ Bronx Bombers - might be an upgrade? 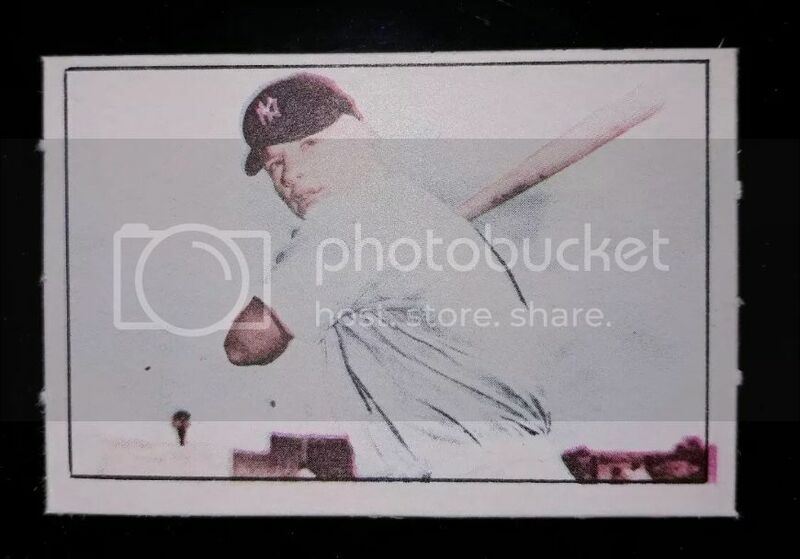 1952 Exhibits Yankees Team card RECEIVED PSA 4 VG-EX? Last edited by swarmee; 04-12-2019 at 08:21 PM. Don’t know a ton about this other than my father owned it in the 60s. He never hung it up, and it remained rolled until we unearthed it from his childhood home. There is some staining, but it’s a really awesome piece. It measures 44 inches tall and 30 inches wide. If anyone has more info, I’d love to hear anything about it. Last edited by robsbessette; 01-01-2019 at 04:32 PM. That’s a fantastic piece. I have the same poster as does another member of the board. You know the photographer, obviously, but other than that I’ve never learned much in the way of details on it. I may have heard at some point that they were sold at Manny’s, but can’t recall for certain whether that was about this one and, even if so, don’t know if there is any truth to it. I just thought a few of you Mickey Mantle connoisseurs might enjoy seeing this. 1) The original Sports Collectors Digest ad from the January 15, 1988 issue, when Mr. Mint announced the purchase of the Barbara Grossman collection of New York Yankee cards and all sorts of other items devoted to her beloved Bronx Bombers. Mr. Mint devoted two photo arrangements of some of the marquee items, among which was a mint 1962 JELL-O unfolded box of Mickey Mantle. 2) I devoted chapter 1 of my book on immediate post-war regional / food issues, Never Cheaper By the Dozen, to this intriguing set, the few, BUT STRONG, childhood memories I have of them, and the occasion when I purchased this very same box from Mr. Rosen at the fall 1988 Philly Show. Back in the spring of 2016, Sports Collectors Daily editor Rich Mueller kindly ran the chapter in his fine net hobby magazine. Here is the link. 3) I present to you the image of the '62 JELL-O Mantle box from my book. In preparing for the photo-shoot, I will always remember when my dear wife beautifully recreated how the apple JELL-O would have looked. Doesn't it make your stomach ah... turn for the worse? Last edited by brian1961; 01-13-2019 at 08:58 PM. I picked up these two in the last couple weeks. That’s awesome Brian. Always knew you had that beauty but awesome to know a bit more of the history of it. The photo is a bit difficult to see but looks like a 1960 Post and a 1959 Home Run Derby. Can anyone make out the others? Ps. I’ve enjoyed hearing your collecting stories, both buy phone and through your terrific book. Your knowledge is an asset to the hobby. And, I would have loved to see your collection back in the day. Chris, you may have heard that from me. I remember looking through an old baseball magazine a year or so ago and seeing a Manny's ad with that poster being offered. I've looked through a few old magazines with Mantle on the cover this morning hoping I could find it again, but I haven't found it. As you know, I've moved recently and have stuffed a bunch of items in a closet. I'm hoping that's where my non-Mantle old magazines are at. I did get rid of my Street and Smith magazines (at least the non-Mantle covers) and am hoping it wasn't in one of them. I'll keep looking. Last edited by hcv123; 01-02-2019 at 10:58 AM. To confirm and identify the other tantalizing cards The Mint Man chose to photo, I believe that Howard has indeed nailed the 1969 Topps Super Baseball Mantle. The others are an O-Pee-Chee "Baseball Stars" Set A 1937 Joe DiMaggio, 1941 Play Ball DiMag, and a 1960 Home Run Derby Mickey Mantle. The year I've given for the latter is not a misprint on my part; rather, the conclusion of my research into this amazing black 'n white set. I devoted chapter 8 to the Derby set, and this happens to be the other set that Rich Mueller ran on Sports Collectors Daily. I'm rather certain those adroit among us can Google it, and find the saved article/chapter. Rich was rather taken with my findings, and he and I were hoping to drum up a little business. Didn't work, but he gave it the old college try, for which I am grateful to him. Last edited by brian1961; 01-03-2019 at 12:09 PM. 1) The original Sports Collectors Digest ad from early 1988 when Mr. Mint announced the purchase of the Barbara Grossman collection of New York Yankee cards and all sorts of other items devoted to her beloved bombers. Mr. Mint devoted two photo arrangements with some of the marquee items, among which was a 1962 JELL-O mint unfolded box of Mickey Mantle. Thanks for posting, Brian. That's an incredible Jello box. No disrespect, but how cheesy is the bottom of that ad where Mr. Mint does himself up a la Mantle's '53 Topps card? I've never seen that before. He was an um...interesting guy. Last edited by jchcollins; 01-02-2019 at 12:55 PM. John, you are quite right about the cheesy caricature of Alan Rosen appearing as Mickey Mantle's '53 Topps. However, this was really an attractive self-indulgence, and at this time, Mickey Mantle mania had exploded in the hobby. Alan knew a thing or two about timing. Also John, prior to the "'53 Topps Alan Rosen", The Mint Man used a rather hideous caricature of himself in his bi-weekly SCD ads(when the hobby's premier periodical was bi-weekly). It was a side profile drawing of his head, with Alan sporting an over-the-top gargantuan nose. I chuckle and wince at the same time. During this era of the hobby, nobody, and I mean NOBODY, did as much grandiose self-promoting as Mr. Rosen. Just as I wrote in the '62 JELL-O chapter I linked, those flashy expensive ads desiring to buy your cards, showed up in nearly every issue SCD, and they most assuredly got every collector's attention. Anybody wanting to cash in their cards would inevitably think of contacting "the Marquis de Wad", "the crowned head of lettuce", to see how many $100 bills they would soon be holding! Yeah, John, an interesting guy...... But you know, many of the crown jewels in my collection may be traced directly, or indirectly, to Alan "Mr. Mint" Rosen. Again, as I wrote, I try to keep an attitude of gratitude. I have my own Rosen horror stories, and it's better for my health that I dwell on the ups, rather than the downs. Last edited by brian1961; 01-04-2019 at 11:43 AM. Was hoping for a PSA 6, but oh well. Great stuff in this thread!!!! Wow, this thread was started back in 2016! It’s probably not a Net54baseball record — but still - wow! I have a somewhat humorous story to tell about this 1960 Mantle card. A former New Yorker lived a few doors down from me in my previous mid-Michigan neighborhood. I never saw any visitors at his house — so I don’t think he had many friends. He had also recently gone through a sad divorce. He’d often wander down to my house when he saw me working in the front yard. I enjoyed chatting with him because I loved hearing his Bronx accent. One day our conversation turned to sports — and then to baseball cards. I brought out this 1960 Mantle card, and, of course, his eyes light up. He proceeded to tell me about his great childhood collection (that included this card) that, alas, his mom threw out when he went off to college. The funny thing is, as he continued to watched me do my front yard work, and we continued to talk baseball, he slipped the card into his shirt pocket. I noticed it — but didn’t say anything. But, when my wife called me in for lunch, and he started to head for home, I had to tactfully remind him to return the card. For a moment I thought that maybe I had somehow conveyed to him the false impression that I was giving him the card. But the sheepish look on his face told a different story. I’ve since moved to a different Michigan city, but when I see this card, I often think of him. Sometimes I wish I had just given the card to him — rounded corners, severe creases and all. Last edited by Sportscards1086; 01-16-2019 at 08:04 AM. Last edited by sflayank; 01-21-2019 at 06:26 PM. It's a bit odd to see it misspelled 3x in one post, no? Point taken on the armour spelling, thanks. My dear son kindly edited a scan of the aforementioned TRUE MINT, page 63, to the requisite KB limit a jpeg is allowed to have on this forum. 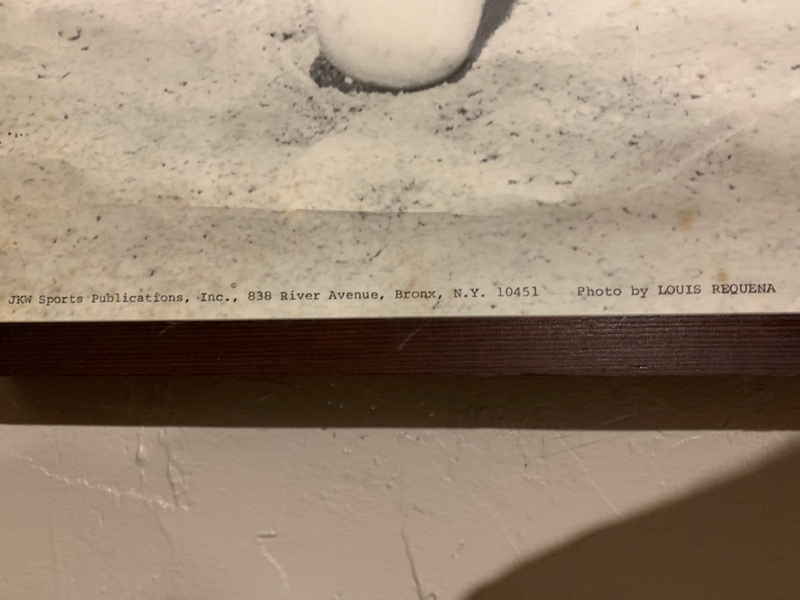 Here we have the celebratory photo being snapped upon the occasion of Mr. Mint's purchase of Barbara Grossman's collection. 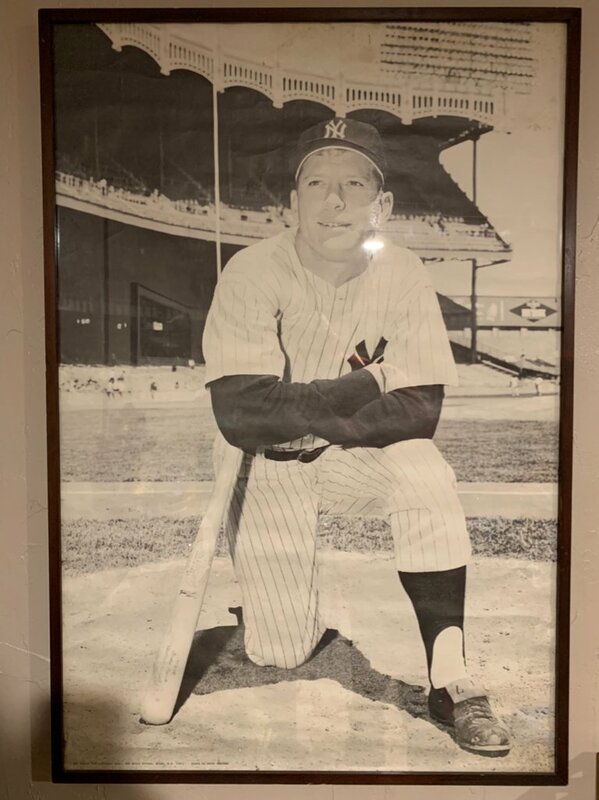 As you read The Mint Man's remembrances, and study the accompanying photo, note carefully what he's holding in his right hand, the card I have given the name, THE MALTESE FALCON OF BASEBALL CARDS, the most profound Mickey Mantle gem of all. Early in the millennium, this particular 1953 Stahl-Meyer Franks Mickey Mantle was graded by PSA. When the registered mail box was delivered to its owner, and he unwrapped the layers of bubble wrap to see PSA's verdict, he began weeping uncontrollably with utter joy, for the label said, "PSA 9 MINT"! A verified flawless, priceless, and king-sized blue diamond or ruby of a Mickey Mantle baseball card, this. Last edited by brian1961; 01-31-2019 at 12:23 PM. 18 year old Mick with the 1950 Joplin Miners. Wow, is that ever nice! I take it it is yours, WWG? A very high percent of these have paper loss like shown due to being pulled open at the glue point. Writing on the back says "New York Yankees" in script, so not too bad for a MK. I actually had a much higher snipe set, so it went cheaper than I expected ($355). Image is really strong. Another one for Bobby's bulk submission. John, I distinctly recall in the late 80s when Mr. Mint Alan Rosen announced to the hobby in the pages of SPORTS COLLECTORS DIGEST that he had just purchased several boxes of the rare 1960 Topps Tattoos. In actuality, one could not help tearing the tattoo paper at the top when he opened the pack, because of the way it was put together by Topps. Really, SINCE IT WAS PACKAGED IN SUCH A SURE-TO-DAMAGE FASHION, THE TATTOO SHOULD HAVE BEEN GRADED MUCH HIGHER BY PSA, AND IN POINT OF A STRONG POSSIBILITY, APPEARS SO FRESH AND OTHERWISE UNMARRED TO PROBABLY TRACE TO MR. MINT'S FIND. Just my 2 cents. For what it's worth, I think it's a cool mark of respect to your Mantle collection! Yeah, for a 1, it's really nice. I had no problem paying up for it since it's such a rare item. The fact that it was graded many years ago (prior to the FAIR grade) may increase the chance it was from a Mr. Mint find. There is an eBay seller who still has a lot of the unopened packs, and continually lists them at high prices. It's funny, I could jump ahead of some people on the registry for this card if I sent it in for review and it got bumped to FAIR 1.5 (MK). As of right now, 2(Q), 1(Q), and Auth all count for 1 point in the registry, but 1.5(Q) actually counts for 1.5. Never figured out why they added that loophole when they changed the point values 2 years ago. eBay mailday today on this card that I’ve wanted for quite some time. Very cool to finally have it in-hand. If this thing isn’t dead nuts centered, it’s damn close. 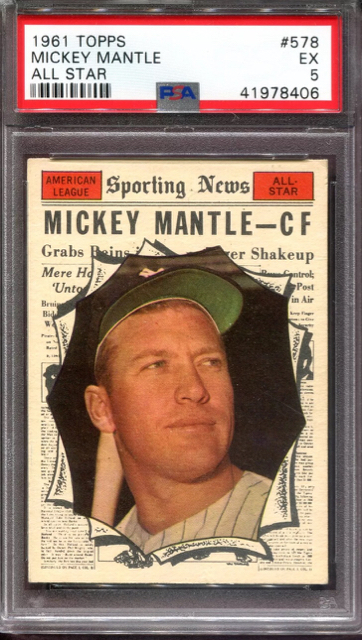 Always thought this concept for AS cards was neat, the bursting out of the headlines - and think on the whole this is an underrated Mantle card. Last edited by jchcollins; 03-01-2019 at 02:24 PM. Great card John. Looks under graded. I agree it is an underrated Mick card. Tough for us set builders as a high # '61. This is just a detail, but another thing I love about this card is it list him as "CF" instead of just an oufielder. Only the AS cards did that because they were by position for each league. I'm a new collector, really just started this past summer, but here are my 3 mantles so far. I hope to build a nice set of all of his vintage cards some day. Great looking example of that card. Agree very underrated and hard to find centered like that. 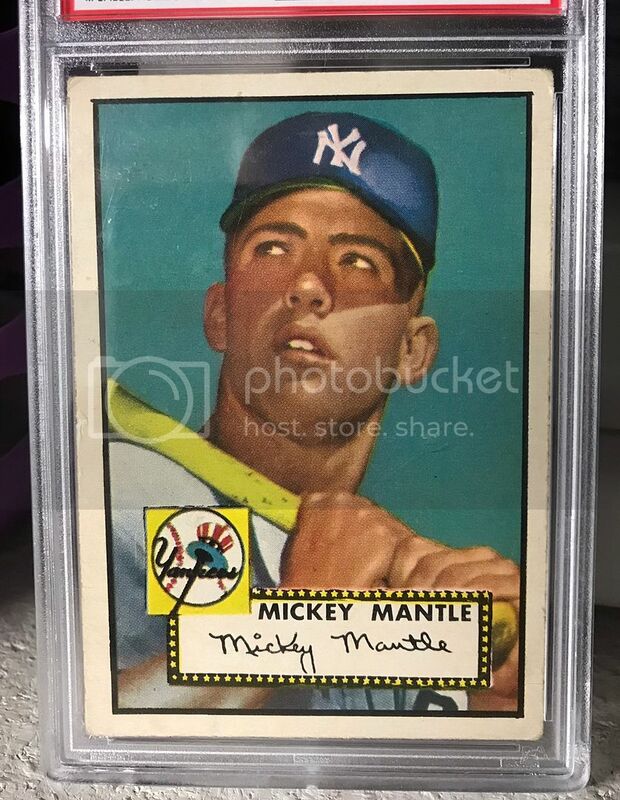 The design really stands out; when my son was old enough to start checking out cards that was his favorite Mantle along with 55B, because of the creative designs. Phenomenal example of the 52T right there; huge eye appeal for the technical grade. Congrats. ^^Totally agree. Nice card. I think i'll spend some time alone this weekend with my Micks. Been contemplating on adding a few more. What ya think? A 53 or 56. Have a hard time with the 56 tho, if the white back matters more than the grey back. Congrats on the rare color. There are sooooo many different color schemes for the Armour coins that I have avoided going after them. I have at least one example of each and multiples of a couple of them, but I think trying to get each color variation is a daunting task. Congrats on this one and on every one that you have. Have a hard time with the 56 tho, if the white back matters more than the grey back. Don't worry about it and just get both. Recent Heritage pickup. Good God does that sales tax sting, though, LOL! Sometimes their scans are brighter than the card in hand, yet this card shocked me when it arrived; such white borders and the centering and corners are fantastic. Best 59 I've held or owned and definitey should've gotten the .5 love when it was graded. Last edited by MattyC; 03-02-2019 at 11:34 AM. Not a Mick collector per se. Saw this tray at the Philly show. Was told it is exceedingly rare. Especially autographed. Is that so? Cool item none the less. 3 raw Micks I picked up today. 69 is more oc than I would like but I actually didn't have one, the color was appealing and the price was right. The 58 AS has a crease and there is some wax staining on the back but the price was too good to pass up and most of all...it's well centered! The 67, well, it speaks for itself. Beautiful card, nm corners and decent centering. I just don't know how PSA is going to feel about the tiny, pink print dot at the top. Might have paid a tiny bit too much for his one but no regrets! Nice cards; I only won 1 last night in the Small Traditions, the PSA 5(MK) Holiday Inn postcard. I was bidding on a bunch of the picture pack cards, but you guys wanted them more. Also, I just opened up a glass display case in the Smith's Antique Mall in Destin, FL. Has 20 of my PSA graded Mantle duplicates along with a whole host of other cards and autographs. Nice display...but you aren't worried about that blinding fluorescent light directly above your cards? Last edited by jchcollins; 03-04-2019 at 01:15 PM. Tim, I have a '67 with the exact same red print dot. Mine came back a 6. Doesn't look as nice as yours, however. Nice Mick pick ups! P.S. I never thought the dot might be recurring until you posted yours. Might we have found a new print variation? Last edited by stlcardsfan; 03-04-2019 at 04:07 PM. Yes, and I had already asked them to remove the bulb. If they can't, they're going to call me and I'll rearrange the booth a little to put some different stuff up top and move the cards/autos further down.